Rebecca Marrama shares her approachable and genuine personality with each and every patient. She takes pleasure in learning about their personal difficulties, and in building trusting, long lasting relationships. Her patients are then continually comforted by her encouraging nature, while receiving motivating and unyielding rehabilitative treatment. Becca produces valued, comprehensive and thorough therapeutic outcomes. Rebecca Marrama began her athletic career at Brestyan’s American Gymnastics Club in Burlington, MA, at age three. She trained with founders Mihai and Silvia Brestyan, and began competing at age seven. For years, Becca intensely focused on gymnastics becoming a USAG Region 6 Level 10 athlete, which she maintained for 5 years. Level 10 is the highest level in the USA Gymnastics Junior Olympics Program. Becca also qualified for regional championships five times, and after graduating from Lynnfield High School in Lynnfield, MA, was ultimately recruited to the University of New Hampshire Wildcats, a collegiate women’s gymnastics team competing at the NCAA Division I level. At UNH, Becca Marrama majored in Nutrition and Wellness, focusing on chemistry, anatomy, physiology and microbiology, plus taking courses on stress, wellness and exercise science. When not studying, Becca continued to dedicate her time to gymnastics on the college team. She traveled the country competing her junior and senior years of school in floor and vault events. 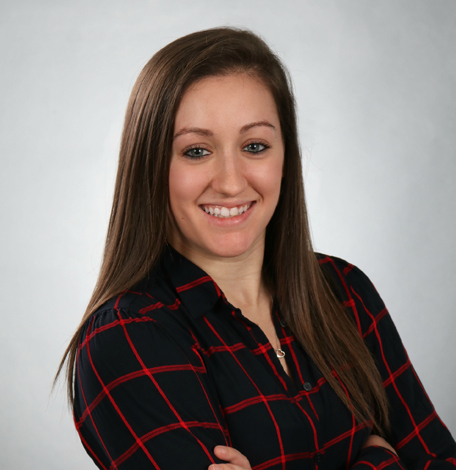 Upon graduating with her BS in Nutrition and Wellness, Miss Marrama began working as a part time aide at HDPT Wakefield, as well as a part time gymnastics coach and competition judge. However, she always knew she wanted to further her career and combine her passion for health and wellness, with her love for gymnastics and helping young female athletes. Miss Marrama attended North Shore Community College and studied to become a Physical Therapist Assistant. Becca completed clinical rotations in an inpatient SNF facility and two area outpatient clinics. After graduation from NSCC, Becca worked with another area outpatient PT company for one year, before returning home to HD Physical Therapy as a full time therapist in September of 2017. Miss Marrama continues to draw on her extensive background as a competitive gymnast and medical professional to address the unique needs of gymnasts, their parents and their coaches. Becca currently resides in Medford with her fiancée Chad, still judges local gymnastics competitions, and enjoys cooking and exercising. FUN FACT: Becca is 5’ tall and often uses her custom, monogrammed step stool to reach and treat patients!